OKI proColor pro920WT | PKA Associates, Inc.
A professional t-shirt and apparel printing business needs a workhorse that can turn out breathtaking output at a fast pace for just pennies per page, and can fit comfortably into an already pre-existing workflow. For a creative printing professional that needs options outside the color model, the OKI proColor 920WT white toner printer offers no limits. Using a combination of cyan, magenta, and yellow toners to compose black and all other colors, and a unique white toner, the OKI pro920WT is perfect for printing custom t-shirt transfers with NO excess polymer or background, or even creative printing onto specialty or colored/dark-colored cardstocks and other media. are also more resistant to moisture, making the pro920WT printer a perfect sticker, decal, or window cling printer as well! With its exceptional media handling system, the OKI proColor pro920WT can print even your most creative, colorful of dreams. 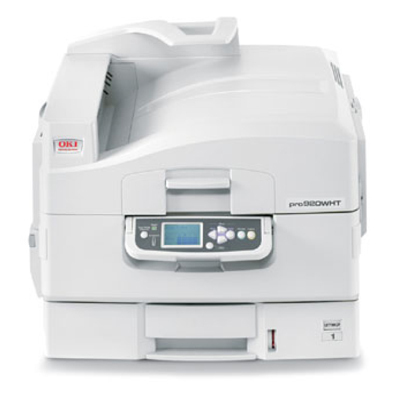 The new OKI proColor 920WT digital color printer is the perfect solution for your on-demand printing needs, and with the addition of white toner, allows for lower-cost textile transfer media for direct imaging to fabric applications. It’s also perfect for lower-cost signage and films that require white. 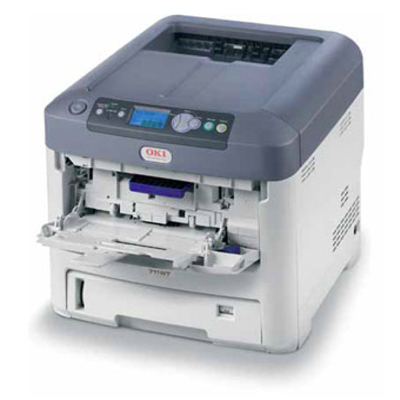 Be the first to review “OKI proColor pro920WT” Click here to cancel reply.